Did you leave the Thanksgiving table last week feeling stuffed? How many us remembered how privileged that feeling really is? Every year, in December, food bloggers from around the world gather their kindness in the form of prizes for Menu for Hope, an annual charity event organized by the force of nature at Chez Pim. Five years ago, the South Asian tsunami inspired Pim to pull together bloggers from the around the world, ready to give of their time and talents, to raise money for the victims. For the past five years, we have been donating baked goods, wine tours, photography classes, and great bottles of olive oil (and much, much more) to raise funds for the UN World Food Programme’s Purchase for Progess campaign. 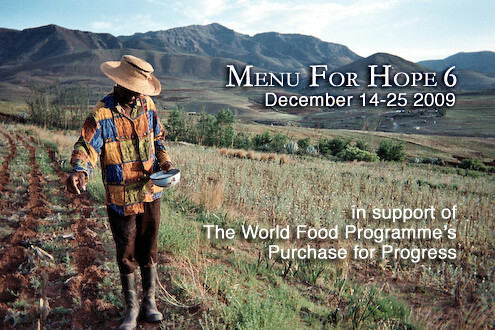 This year, I am honored and humbled to be hosting the west coast contingent of Menu for Hope. If you live west of the Mississippi, and you want to help give, start sending me email. So, if you are new to this, you may be wondering what this is all about. 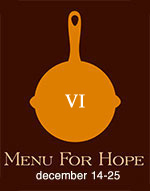 Menu for Hope is a giant virtual raffle, essentially. Bloggers from around the world will be donating enormous baskets of delicious food or a pile of cookbooks or market tours through Paris. If you want to win one of them, all you have to do is donate $10 to the cause. Each $10 ticket gives you the chance to win a particular prize. The more you donate, the better chance you have of winning. And of course, the more will go to Purchase for Progress. And what is Purchase for Progress? To quote Pim, “Once again we’ve chosen to work with the UN World Food Programme. WFP is the worlds largest food aid agency, working with over 1,000 other organizations in over 75 countries. In addition to providing food, the World Food Program helps hungry people to become self-reliant so that they escape hunger for good. We food bloggers are such a lucky lot. We have enough food on our tables that we can take the time to photograph it. It’s good to be reminded of that blessing. And give back to others, if we can. What can each of you reading do to participate? Well, most of you will probably read and decide on a prize and donate. That is the most important act. The more people who bid, the more money we raise, and the more farmers will be helped. Please, participate. If you keep a food blog, and you’d like to donate a prize, thanks! However, as much as we would love to have everyone who runs a food blog involved in this, each of the hosts would be overloaded with prizes, leaving no one to bid. If you believe that your prize could raise at least $200 for the cause (that’s 20 of your readers donating $10 each), then by all means. Send in your proposed prize. Again, if you live in the western half of the United States, and you would like to donate a prize, send me an email at glutenfreegirl[at]gmail[dot]com. Please tell me the name of your blog, a description of your prize in fewer than 140 words, and any shipping restrictions. Also, I need two images of your prize, both a 75×75 thumbnail and a 200x200px. I will send you back a prize code, which will be the number readers will use to bid on your prize. After I have sent you the prize code, put up a post on your blog, describing your prize, urging your readers to bid on it, and why. Then, send me the url for your post. I’ll be collating everything together and putting them in an enormous post on Monday, December 14th. Come back that night for an encylopedic list of everything you could win. The raffle (and urging reminder posts) will continue until December 25th. Winners will be announced in January. Clear? If not, please leave me questions here! Okay, whew. That is a lot of information. So many people need food. You can help. We can do this together.